Easter has always been symbolic with renewal, a time to begin again. Days are longer, the air is fresh and crisp, the landscape brightens with hyacinths and daffodils that awake from beneath their winter blanket to delight us with their cherry color and there is a definite spring in our step. Whether you celebrate Easter, Passover or are just happy to have old man winter say farewell, this is a time to gather family and friends at the table to share in a spirit of renewal. For me, nothing is more of a connector to family and friends than when a holiday meal is planned and everyone can be involved in some way. I like to set a festive table with pastel colors and beautiful spring flowers. And I want to choose a menu that is easy but elegant too. Roast spring lamb perfumed with fresh rosemary and garlic and served with new potatoes is a great favorite. But if you are not a lamb fan, consider a turkey or glazed ham for your main offering. Fresh asparagus are in season and make a great accompaniment to lamb. Purple and red beets served with crisp carrots makes for a colorful salad and for dessert, chocolate in some guise is a must, either a light and airy mousse or a delicious dense and fudgy chocolate tart with walnut cream sauce will do just fine. And what would the day be without those Easter baskets! Even as my children reached young adulthood, they still looked forward to them. I tried to be imaginative with each one, giving something that defined their personalities and interests. In years past, my husband got chocolate bunnies pushing wheelbarrows because he is a gardener. He got packages of seeds, gummy worms and a new plant mister. My son, the basketball fan and exercise lover, got chocolate basketballs, jellybeans and running gear. My daughter, the world traveler, got a chocolate globe, chocolate cream eggs and a travel journal. Me? I did not get a basket. I just help myself to theirs…when they are not looking. Some things are better left unnoticed. Easter signals a lifting of our spirits; we feel happier, lighter, more content and we can brush off the heaviness of winter’s coat and look forward to nature’s promise of bright and long sunny days. 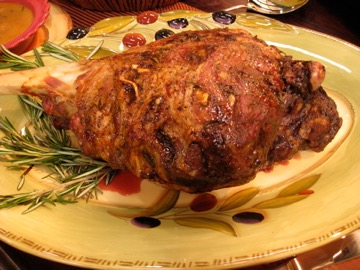 Roasted spring lamb takes the place of honor on the Easter table. Lamb is prepared in many ways; grilled on a spit, braised, stewed, and oven roasted. Dry off the meat dry with paper towels. With a small knife make slits about 1-inch deep all over the meat and insert the slivers of garlic and rosemary. In a small bowl, combine the olive oil, salt, and pepper and mix well with a fork. Rub the mixture all over the lamb, coating it well. Place the meat in a deep dish, cover it, and let it marinate in the refrigerator for 2 to 3 hours. Place the lamb on a rack in a roasting pan and add the wine to the pan. Roast for 1 to 1 -1/2 hours or until a meat thermometer inserted in the thickest part of the leg registers an internal temperature of 135-140ºF for medium rare or 160ºF for medium. Baste the meat every 15 minutes with the pan juices. Transfer the roast to a cutting board and let it cool slightly. Carve into pieces, arrange on a platter, and pour the pan juices over the meat. Serve immediately. To make a gravy for the roast, skim off the top fat from the pan drippings and place the pan over two stove top burners. Over medium heat stir in 1 tablespoon of flour and 1 1/2 cups of chicken broth and stir to make a smooth sauce. Season with salt and pepper and serve on the side.